I don't know about you but something about the first week back at work totally wipes me out! And we don't even have students yet- jeesh! Anyways, as part of the Teacher Week Blog Hoppin' event I'm going to share a few of my favorite organizational ideas. Let me start by saying how much I love to organize. I enjoy making lists, creating special places for everything, and planning the perfect routines. Eventually (like when the students get here :) ) some of those plans go out the window and I settle for a functional presentation that can be easily managed. Here are some of my best organizational ideas. I can promise you that although this may be my first post about organization, it definitely won't be the last. 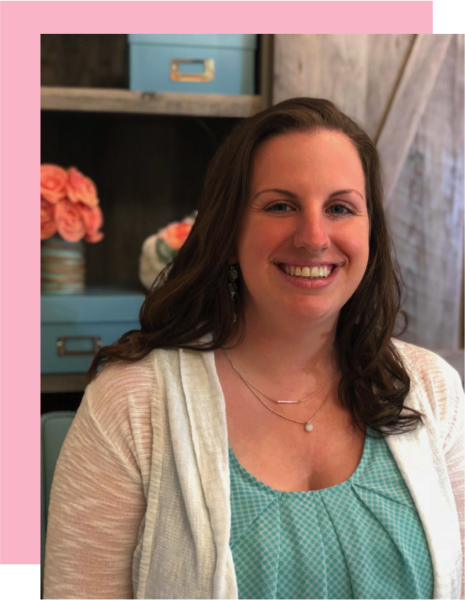 Tip #1- Make organization student friendly. For example, my library has labels that are easy to read and include pictures for my young readers. Students can look at the cover of a book and decide which basket it needs to be put back into. Now let's be real, first graders often struggle categorizing books (especially if you are a bit picky about everything actually being in it's correct space). To help them out I put a matching label on the back of each book (printed on Avery sticker labels). Every Clifford book has a small picture of Clifford on the back, Biscuit has a Biscuit sticker, etc. Now this is pretty self explanatory for books like this but it makes an even bigger difference when categorizing other fictional titles into topics like School, Friendship, or Fairy Tales. Another example of student friendly organization is my Take Home Book box. I print books from Reading A-Z and store them in hanging folders. Each book uses colored Washi Tape on the spine, the edge of the file, and the hanging folder itself. Students know what their independent reading level is according to our running records. They are allowed to take home one book each night. The next morning it is their job to return it to the correct folder by level (with color code matching to simplify even further) and choose a new book. This puts books into the hands of many students who do not have them at home and also teaches responsibility if they want a new book. Tip #2-Plan ahead for what you know is coming. Each year you know you will gather seasonal items- Easter Basket, Snowman game, Halloween books, etc. Create a simple box for each season and store all seasonal containers, books, games, and craft materials inside. 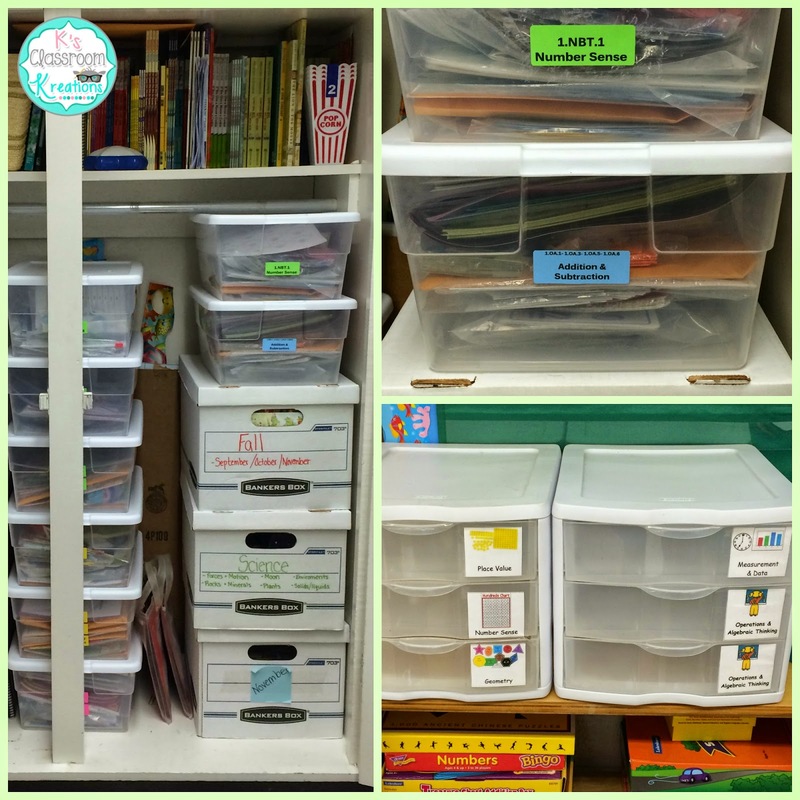 Declutter the classroom by putting it out of the way and return the appearance of organization (even if the inside of the box is a hot mess). Also, it never fails that as soon as you are settled into routines a new student will arrive. 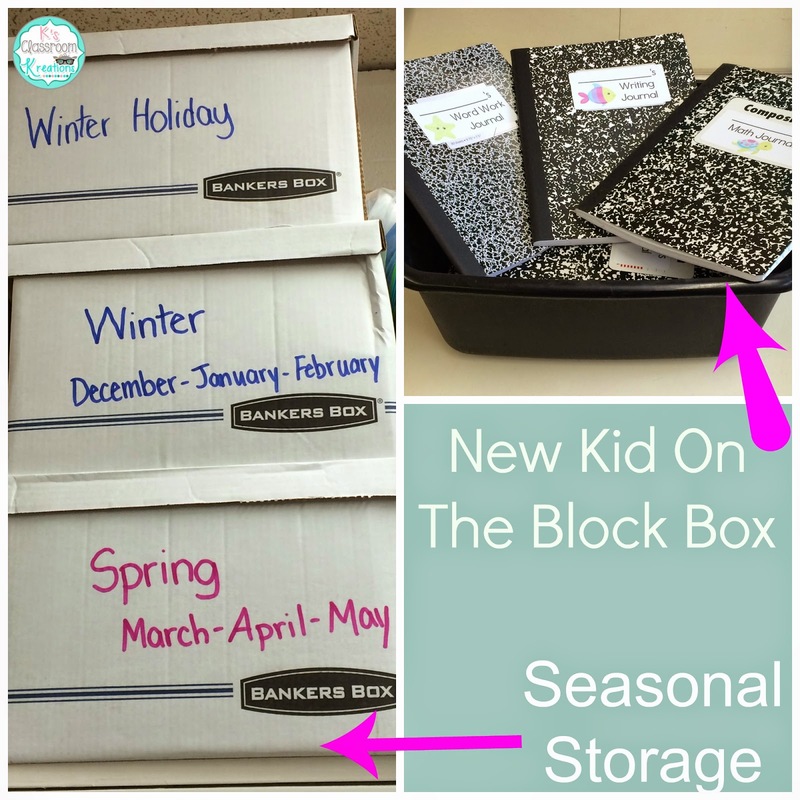 Well- create a "New Kid on the Block Box" now at the beginning of the year to save time later. 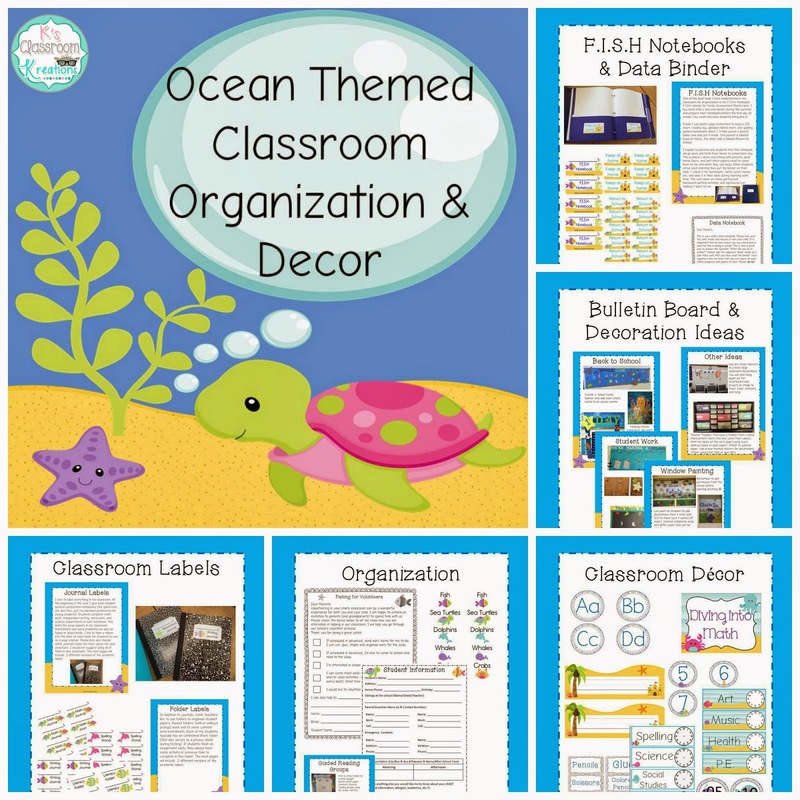 Create a few extra sets of all notebooks, folders, welcome letters/classroom rules, and anything else you know all students will need. When a new student arrives (typically in the middle of a lesson) everything will already be prepared. Tip #3- Divide centers by standard. Ever end up with a ton of centers and missing pieces? Forget what you have? Divide math centers (or literacy) into different bins. Use one for each objective. These boxes are labeled by the Common Core standard to make my lesson planning even easier. Simply grab a few boxes, put a variety into the drawers for a spiraling review, and plug the names of each center into my lesson plan. I also use an address label with the standard printed on it to label each center inside the box. This helps my Teacher Assistant, a sub, parent volunteer, or student help me put things away if needed. Tip #4- Plan 2 weeks ahead. 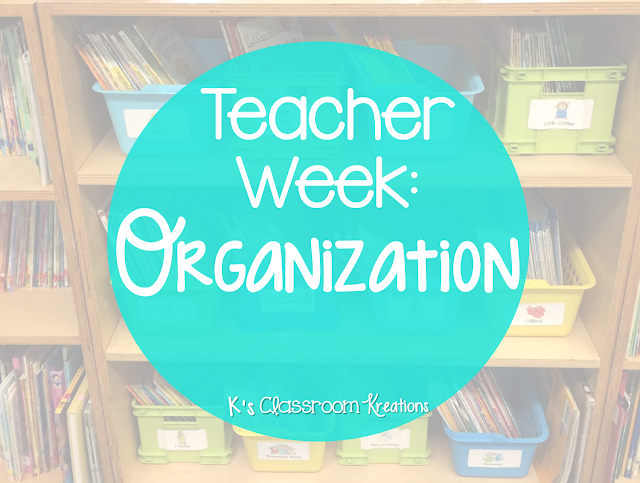 I use a file organizer to help plan lessons in advance. Once I have the lesson typed I slide a copy of each day's plan into the proper folder. Homework pages, quizzes, worksheets, read aloud books, and other support materials are added. I use one set of plastic folder labeled Monday-Friday, and another set of the papery type labeled Monday-Friday for the following week. 2 different materials help me keep the weeks straight. One of the best tools I have implemented in my classroom for organization is my F.I.S.H Notebook. F.I.S.H stands for Family Involvement Starts Here. I buy each child a one inch binder during the summer and prepare their notebooks before the first day of school. You could also have students bring one in. Inside I use a plastic page protector to keep a 120 chart, reading log, alphabet/blend chart, and spelling options homework sheet. I 3-hole punch a pocket folder and also put it inside. One pocket is labeled "Keep at Home" and the other is labeled "Return to School". I explain to parents and students that this notebook will go back and forth from home to school each day. This is where I share everything with parents, send home flyer, and sort which papers need to come back to me and which they can keep. When students arrive each morning they put the binder on their desk. I check them for homework, notes, lunch money, and then slide them into each child's desk. This cuts down on notes getting lost, homework getting wrinkled, and signatures not making it back to me. I also use Data Notebooks to keep track of all assessments, spelling tests, documentation of sight word recall, graphs for student data, and more. I send the binder home once a week for a parent signature. All work remains inside the binder. 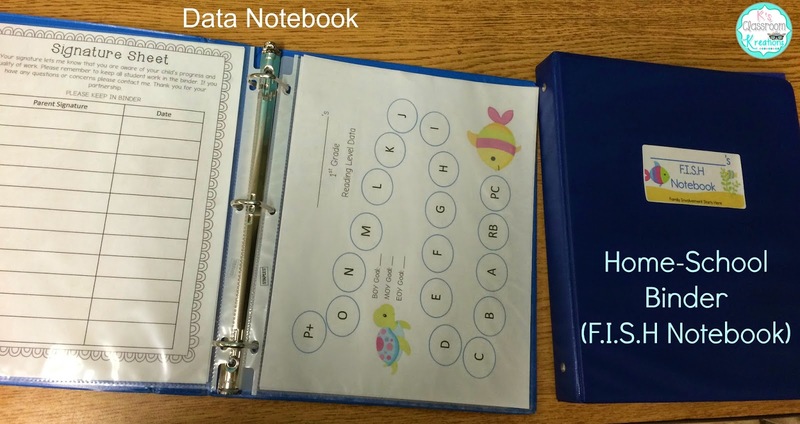 These data notebooks come in extremely handy when having IEP meetings, Parent Teacher Conferences, or goal setting meetings with each student. Thanks for stopping by. I hope you are leaving feeling prepared for the new year and ready to become more organized. Don't forget to keep on blog hoppin' for even more great ideas.